In case you've missed or ignored all the five-star reviews and impressive box-office figures, The Social Network is a very, very good film. Half parable, half character study, the story of Facebook founder Mark Zuckerberg shows how big ideas tend create an equally big trail of destruction for those involved. No matter how trivial Facebook may turn out to be, there is an echo in its creation of the great intellectual disputes of the 20th Century - Marconi vs Logie Baird, or Rosalind Franklin's often-overlooked contribution to Crick and Watson's discovery of the DNA sequence. If this all sounds a bit dry, bear in mind that the script comes from West Wing creator Aaron Sorkin - a man with a gift for breathing drama into the dry legalese of backroom deals. 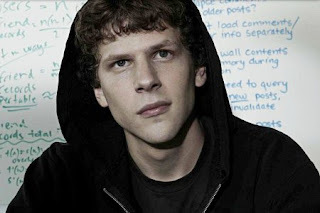 The central performances from Jesse Eisenberg, Andrew Garfield and Armie Harmer (who plays as both Cameron Winklevoss and his twin brother Tyler) are exceptional, too, dashing off the intricate dialogue as if they were in The Inbetweeners, not a drama about coding a website. Anyway, this is supposed to be a blog about music and, aside from the fact that this movie has kept Justin Timberlake out of the studio for another six months (booo), there's a lot of great soundtrack action in The Social Network. Amongst the highlights is a disturbingly dark moog version of In The Hall Of The Mountain King by Trent Reznor. The Nine Inch Nails frontman also compiled the film's licensed music, and pulled off the coup of securing a Beatles track for the closing credits. I have to admit it's one I wasn't familiar with - Baby, You're A Rich Man. A snippet was featured in the Yellow Submarine film back in 1968, but it's more familiar to Beatlemaniacs as the B-side to All You Need Is Love. If The Fab Four were on iTunes, this would have charted after the film was released. Sadly, there's no soundtrack album for The Social Network (although there is a CD of Reznor's score available). Luckily, though, movie music blog Reel Sound has compiled a definitive list of the songs in the film, so you can handcraft your own playlists.